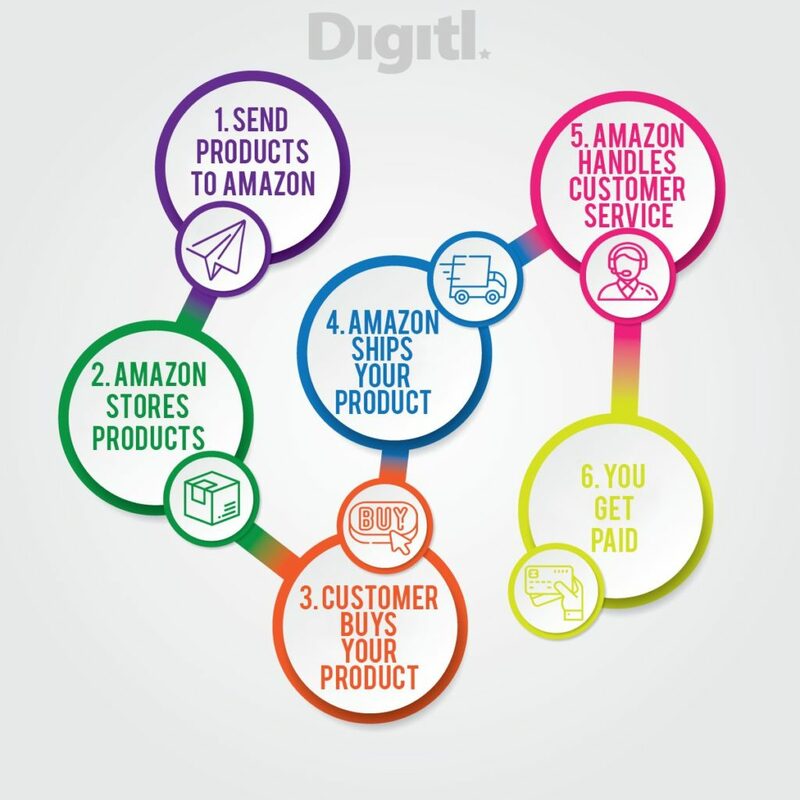 Everything You Need to Know about Selling via Amazon FBA - Digitl. Whether you’re looking to earn some side income or selling online is your full time occupation, the impact of Amazon is hard to ignore. Put simply, Fulfillment by Amazon means that when you receive an order, Amazon handles the handling and shipping process for you. Sounds easy, right? As the largest retailer in the world it’s easy to understand why so many online sellers are growing as a result of letting Amazon worry about their logistics. While FBA seems enticing, there are a number of things you should consider to make sure it is a good fit for your business. Why is Amazon FBA Good for My Business? Amazon Prime – selling through FBA means your products are eligible for Prime delivery, which means that Prime customers can receive your products very quickly (usually within a day) at no cost. 71% of FBA users reported a 20% increase in unit sales since joining FBA. Visibility – Amazon’s algorithm means that Prime products are displayed higher in search results than non-Prime products, which means your products will get seen by more people. Flexible – there are no limits on the number of products you send to Amazon to be sold via FBA, it may be 10 or 10,000. This means you can test the water before committing to lots of stock that may not sell. Customs – if you’re shipping products overseas Amazon will handle all of the regulations and shipping protocols, which makes selling to foreign audiences much easier and less time consuming. Save Time – After sending your stock to Amazon they assume responsibility for picking, packing, organising a courier, returns etc which is often the most mundane and time consumer aspect of being an online seller. Multi-channel Fulfillment – stock that you have sent to Amazon can also be sold on other eCommerce platforms through the FBA warehouses, which again will increase visibility. Better Customer Service – Amazon have a reputation for excellent customer service, which is part of the reason why FBA was created in the first place. By using FBA your customers will have access to their 24/7 support system. What Are the Problems and Key Things to Remember with FBA? Volume – because of the costs involved it’s important to ensure you commit enough stock to fulfil orders and replenish stock frequently. Strict Packaging Requirements – products must be shipped adhering to Amazon’s strict guidelines, if they aren’t they will be sent back to you and you’ll have to pay for it. Inventory Risks – in the unlikely account that your seller account gets suspended you risk losing your inventory if you don’t handle the suspension immediately. More Returns – enabling an easy returns process means that people feel more comfortable actually sending products back. Limited Control Over Customer Service – since Amazon control your customer service, this may create a disconnect between you and your customers. People may want to speak to you directly or request that their items have a personal touch. We spoke to a handful of leading experts in this area, and here’s what they think you should consider for your FBA business. If you want to take the next steps with FBA feel free to give us a shout (you can do that via KevBot to the bottom corner of this page) but these links are great starting points too. Interested in finding out more about FBA? Our annual conference in collaboration with Online Seller UK returns this May, click here!